I've always been aware that injured people go to the doctor and get stitches and "STAPLES." what I didn't know was that the staples you get from a Doctor, are.... Office Max, school teacher, cork board, STAPLES, one and the same. Sorry Irene, I should have warned you. Just take a deep breath and put your head between your knees until the room stops spinning. I can't tell you how much my sisters stomach trips me out! Why in the world did they cut around her belly button like that?? My son just asked me "What dinosaur is that?" lol! 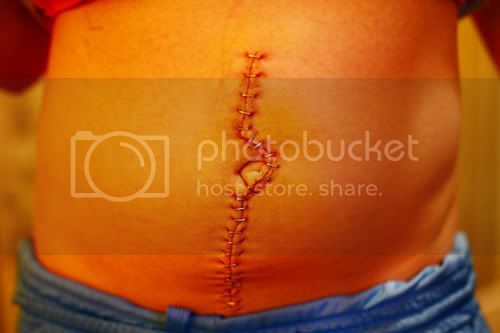 Let's just make today the offical "enjoy your less than stellar stomach cause it could look like this" Day! Love you KD bug! Thanks for, making me like my tummy! OHHHH the memories! =o( I feel so bad for KD, I know the pain! AAAAAAhhhhhh! Dito on making me love my tummy..... a little.... Poor Girl! Speedy recovery. KD's not pregnant? hehe, jk :) We love ya KD- get better soon! Oh and my hair looks amazing, you're the best! Oh my gosh! Poor girl! :( Hope your recovery goes well KD!! Wow KD! You poor thing. Have Ryder kiss it better.lol! I'm okay Omi, I didn't pass out this time just tell KD not to pull up her shirt when I see her. Luv Irene.